Yogi Roth is a tough person to pinpoint. He has interests and accomplishments in a lot of areas. He’s a walk-on-turned-full-scholarship wide receiver. He’s a college football analyst. He’s a writer. He’s a documentary producer. He’s a world traveler. He admitted that it’s even hard to introduce himself sometimes. His mission is crystal clear, though: To seek & uncover the humanity in sports around the globe through storytelling. In this episode, we talk about his drive, how he landed Pete Carroll as a mentor & friend and how he uses visualization & meditation to improve his craft. We’re all seekers – seeking our dream job, the perfect spouse, our big break. Seeking is normal. What’s abnormal is enjoying every step of it. Enjoying the heartache and obstacles that are in the way of what we’re seeking. 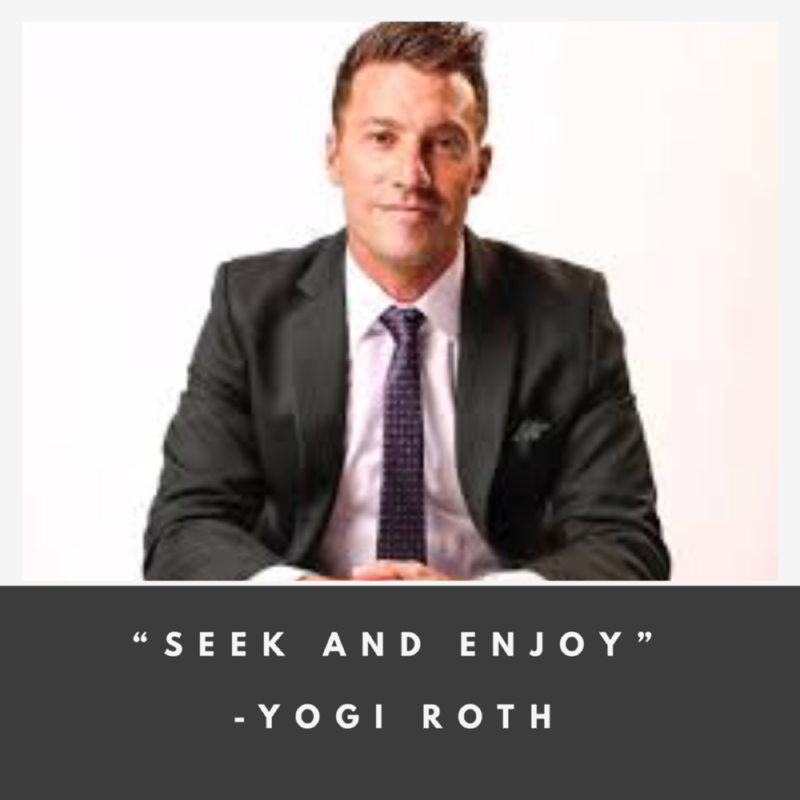 That’s Yogi’s mantra: “seek and enjoy”. I asked Yogi “How does the 25-year-old listening to this podcast get great mentors like you did?” His answer? Recruit them. It’s never been easier to get in touch with someone. Whether it’s by email, phone, handwritten letter or Instagram DM, everyone is accessible. If you’re persistent and add value, you can recruit the perfect mentor. He even goes a step further to call these mentors his “Life Board of Directors” and include some of the most notable coaches in the world, professional athletes and executives at Nike. When Yogi was 19-years-old, he was an Assistant Coach for Pete Carroll at USC. Pete told Yogi that he didn’t need to worry about climbing the ladder rung by rung if he added value at each step. Yogi took this as a challenge to add tremendous value at the smallest of tasks. His sole job at one point was to staple papers together for the playbook. He vowed that he would be the absolute best stapler that the coaching staff had ever seen. He added value. Most of us (myself included) go through life jumping from note to note. From waking up to a workout to work to dinner to sleep and over again. Yogi prides himself in being able to enjoy the space between the notes – whether it’s a 15-minute crunch to get s quick workout in or a month-long international trip in the offseason – he finds time and cherishes it. Yogi is a grinder. He attributes a lot of his success in his ability to do the lonely work. Whoever can do the boring work the longest will win. If you sit down and write that blog, make that cold call or even staple that next paper – you’re inching your way closer to success. Like many successful people, Yogi uses visualization to give himself a mental edge. He treats every college football broadcast as if it were The Rose Bowl. He knows that if he puts himself in that mentally place enough times now that he’ll be ready once he’s actually there. We got deep here. Being authentic is really hard for millennials. Especially for me. It’s something I’ve worked really hard at and am still not great at it. Be yourself. Show your quirks. That’s what makes you stand out and makes you, you. Want To Fast-Track Your Personal Development?